Before the eyes of the Israelites, the formidable wall of Jericho crumpled down while leaving no stone on top of another stone. The thundering sound of the falling wall was so loud that they felt the whole earth was shaking like a big earthquake. The people in Jericho believed the wall, which protected so many years. It looked really strong. It reached to heaven. They actually felt fear about the Israelites because they heard about the Israelites and especially their God, who freed the Israelites from Egypt with His mighty hand. For the last seven days, what the Israelites did was very strange. Their priests were in front, and the warriors quietly followed the priests blowing horns. Then they just circled the wall of Jericho. 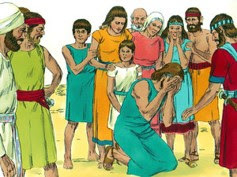 Everyone in the Jericho carefully watched what the Israelites were doing. Initially, they thought that it might be a trick. But nothing suspicious. Really strange. Nobody said anything while the Israelites circled. On the third day, one of the watchmen on top of the wall laughed at the Israelites as circling because it was completely ridiculous to his eye. This laughter suddenly spread out among the entire people in Jericho. All of them were laughing at the Israelites. The laughter was so loud that it was even heard by the Israelites who were circling the wall. On the seventh day, following the God’s command, the Israelites circled seven times, and shouted. The wall that the people of Jericho so much believed suddenly fell. The people of Jericho could not understand what was going on, and they were in chaos. When the people of Israel heard the sound of the rams’ horns, they shouted as loud as they could. The Israelites charged straight into the town and captured it. There was no resistance because the people of Jericho were in chaos. They completely destroyed everything in it with their swords—men and women, young and old, cattle, sheep, goats, and donkeys. Before this miracle, Joshua commanded the people, “Shout! For the LORD has given you the town! Jericho and everything in it must be completely destroyed as an offering to the LORD. Only Rahab the prostitute and the others in her house will be spared, for she protected our spies.” Rahab was the person who hid the Israel spies so that the spies could return safely, and they promised to save Rahab and her household. Joshua continued, “Do not take any of the things set apart for destruction, or you yourselves will be completely destroyed, and you will bring trouble on the camp of Israel. Everything made from silver, gold, bronze, or iron is sacred to the LORD and must be brought into his treasury.” Joshua commanded not to spare anything except those that were sacred to God, which could be given to God’s treasury. Then the men who had been spies went in and brought out Rahab, her father, mother, brothers, and all the other relatives who were with her. They moved her whole family to a safe place near the camp of Israel. The Israelites burned the town and everything in it. Only the things made from silver, gold, bronze, or iron were kept for the treasury of the LORD’s house as commanded by God. God was great. 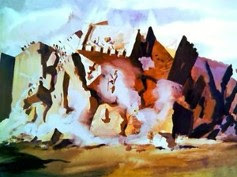 His power was above everything including the wall of Jericho, which was invincible for decades. They praised God and His Glorious Name! But all of the Israelites were not completely obedient. A man named Achan had stolen some of these dedicated things. Achan thought that nobody would know if he secretly saved some of the beautiful and precious things on his eyes. He hid them. Yes, nobody knew what Achan did. All of them were in the highest celebration mood because it was the first victory in the Premised Land. Jericho was the biggest and strongest. With God, there was nothing that could block their going through the Promised Land. All of them felt that finally they possessed the Promised Land. All believed that from the point, they just marched through the Promised Land and occupied the land. Some of them even felt that they were invincible. They defeated the biggest and strongest Jericho. Nobody in the land could challenge the Israelites anymore. 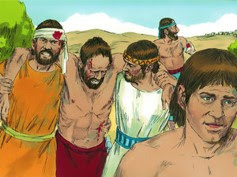 Following the huge victory at the Jericho battle, all of them were really confident. Then Joshua brought his people and told them they would repeat the victory again. The people heard Joshua and shouted together in joy because the next victory was sure. The next one was Ai, which was far smaller than Jericho, and much weaker than Jericho. It was a piece of cake. Joshua picked some of his men and sent to spy out the town of Ai, east of Bethel, near Beth-aven. The spies returned, and told Joshua, “There’s no need for all of us to go up there; it won’t take more than two or three thousand men to attack Ai. Since there are so few of them, don’t make all our people struggle to go up there.” It was an excellent report. As expected, Ali was an easy one. Joshua hurriedly assembled the elders of Israel, and together tore their clothing in dismay, threw dust on their heads, and bowed face down to the ground before the Ark of the LORD until evening. All of the hopes and dreams were suddenly gone, and instead, they were in fear and darkness. Joshua cried out, “Oh, Sovereign LORD, why did you bring us across the Jordan River if you are going to let the Amorites kill us? If only we had been content to stay on the other side! Lord, what can I say now that Israel has fled from its enemies? For when the Canaanites and all the other people living in the land hear about it, they will surround us and wipe our name off the face of the earth. And then what will happen to the honor of your great name?” Joshua with the elders were in tears before the Father God like children. Early the next morning Joshua brought the tribes of Israel before the LORD, and the tribe of Judah was singled out. Then the clans of Judah came forward, and the clan of Zerah was singled out. Then the families of Zerah came forward, and the family of Zimri was singled out. Every member of Zimri’s family was brought forward person by person, and Achan was singled out. Achan replied, “It is true! I have sinned against the LORD, the God of Israel. 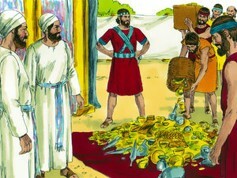 Among the plunder I saw a beautiful robe from Babylon, 200 silver coins, and a bar of gold weighing more than a pound. I wanted them so much that I took them. They are hidden in the ground beneath my tent, with the silver buried deeper than the rest.” Achan loved what he saw, and he took it secretly. Then he hid because he thought that nobody knew what he hid. Achan did not realize that he could not hide the stolen goodies from God. So Joshua sent some men to make a search. They ran to the tent and found the stolen goods hidden there, just as Achan had said, with the silver buried beneath the rest. They took the things from the tent and brought them to Joshua and all the Israelites. Then they laid them on the ground in the presence of the LORD. Then Joshua and all the Israelites took Achan, the silver, the robe, the bar of gold, his sons, daughters, cattle, donkeys, sheep, goats, tent, and everything he had, and they brought them to the valley of Achor. Then Joshua said to Achan, “Why have you brought trouble on us? The LORD will now bring trouble on you.” And all the Israelites stoned Achan and his family and burned their bodies. They piled a great heap of stones over Achan, which remains to this day. That is why the place has been called the Valley of Trouble ever since. So the sin ,which was the barrier between God and the people of Israel, was removed so that God’s promise could continue in their lives. Here is one more message from God. How about Joshua? 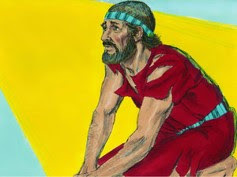 Before occupying Jericho, Joshua prayed to God to know God’s plan and purified himself together with the rest of the Israelites to eliminate any chance of building up a barrier between God and Joshua together with the Israelites. Please see what Joshua did before attacking Ai. What was the mood and the mode of operations of Joshua? How about the rest of the people? They were really confident and almost felt they were invincible. Did they pray to God to listen to God’s plan, and purified to get rid of sins that might be still with Joshua and his people? No. Joshua and his people were in joy and humanly confidence, which was another subtle form of sin. This does not happen to just Joshua and the Israelites after the victory over Jericho. We all become very self-confident as if we achieved a huge victory. This self-confidence is very subtle, but deadly, which easily becomes the very source of our sins. Once we are caught up in such a victory by being confident in ourselves, it is virtually impossible to get out of this trap. Joshua was so faithful before God for forty years, but he could not resist this subtle and formidable temptation. He became a prey of his own confidence. Then who can say that I am immune to such a subtle and formidable temptation? Certainly, nobody. Then how to overcome this temptation? 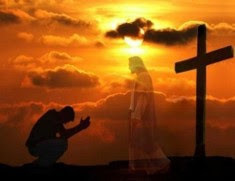 Only is the answer to fix our eyes on Jesus Christ, who is the pioneer and finisher of our faith. This is the very key to how to continue being a victor in our lives in Him, by Him and for Him. Yes, we are more than conqueror in Christ! Praise and Glory to God, whose mercy endures forever! We are His people in His eternal care because He is our Ever-Loving Father. Praise Him! Praise His name from now and forever!